With an aura of strength and agility, the Bearded Collie was bred for centuries as a companion and servant of man. “Collie” is the generic Scottish word for dogs that herd sheep, and the Beardie?۪s long, lean body and agile movement make him well-suited to that task. The breed still herds today, but they are also popular in the conformation, obedience and agility rings. Their medium-length coat is flat, harsh and shaggy. Beardies are born black, blue, brown or fawn, with or without white markings. With maturity, the coat color may lighten. 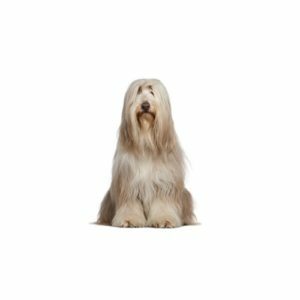 One of Britain?۪s?۪ oldest breeds, Beardies (as they are often called) are believed to have originated with the Komondor in Central Europe, but were used to herd animals in Scotland for so long they became known as the Highland Collie. Later the name was changed to Bearded Collie, since they have long facial hair unlike other collies. Active, outgoing and affectionate, the Beardie makes a wonderful family pet. Like most long-haired breeds, Bearded Collies require a commitment to grooming. They need a few minutes of brushing or combing everyday. This breed also needs exercise, but will make a wonderful addition to many homes. Herding Group; AKC recognized in 1976. Ranging in size from 20 to 22 inches tall at the shoulder. Love average to large yards. Regular trimming and grooming recommended. Are you interested in purchasing a Bearded Collie?